The shoulder joint is the least stable joint in your body. Many people sit at their desks all day, and the usage of their hip and shoulder muscles is limited. One of the leading causes of back and neck pain is the muscle tension that results from the lack of exercise in a sedentary lifestyle. Most people tend to focus on building up their chest and biceps, and tend to neglect strengthening their backs. A limited shoulder range of movement makes it difficult to throw an effective cross or hook. To makeover an entire muscle for better muscle balance and joint stability, you have to work it through a full range of motion. Performing shoulder exercises designed to strengthen the muscles as well as to improve the shoulder range of motion will reduce the stress on the joint making it less susceptible to joint inflammations like tendinitis and bursitis. In a nutshell, improving your passive range of motion will decrease stiffness, soreness, and the need for anti-inflammatory medications. Let’s look at how you can incorporate range-of-motion exercises improve your shoulder range of motion. Before you start incorporating range-of-motion exercises into your training regimen, it can be helpful to understand how your shoulder works. Your shoulder is a complex joint, consisting of various muscles. You've likely heard about or experienced rotator cuff tears which are common in athletes in various sports. Your rotator cuff consists of the supraspinatus, infraspinatus, subscapularis and teres minor. Working with the glenohumeral joint in your shoulder, the tendons of your rotator cuff connect the muscles of your shoulder to your humerus (upper arm) bone. Acromial impingement syndrome, also known as "shoulder impingement" - acromial impingement occurs when your acromion (edge of your scapula) impinges or presses on your rotator cuff during external rotation or when you lift your arm. It's commonly experienced when you have inflammation due to rotator cuff tears or other shoulder injuries. Rotator cuff tears - rotator cuff tears are as unpleasant as they sound. This occurs when one of the muscles around the humerus becomes damaged. It happens often during sports or due to overuse and repetitive motions. Tendonitis - tendonitis occurs when one of the tendons in your rotator cuff gets inflamed or damaged. Burisits - in your shoulder, you have a subacromial bursa, or a sack of fluid that's meant to act as a cushion between your rotator cuff, glenohumeral joint, and humerus. When this becomes inflamed, you will experience shoulder pain and pressure, the two main symptoms of bursitis. All of these issues are responsible for causing shoulder pain and can be offset by improving your passive range of motion. 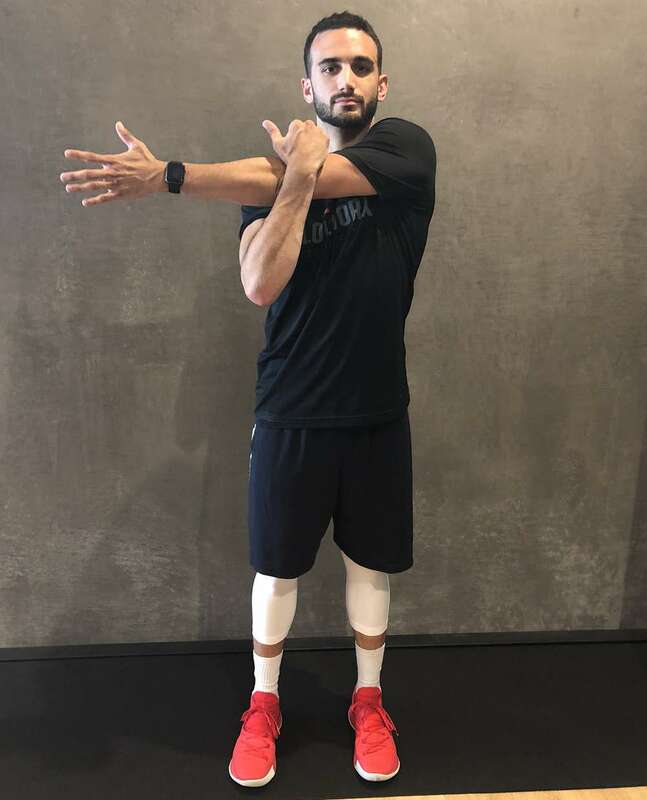 Before starting to work on improving your shoulder range of motion, do the following test to find out your shoulder’s range of motion and the limits you will face with internal rotation and external rotation. You can either stand up straight with your back against a wall or lie down with your back on the floor. The spine, abs, and pelvis should be maintained in a neutral position. Do not arch your back. Exhale and raise your arms up above your head, while trying to bring your arms to the side of your ears. 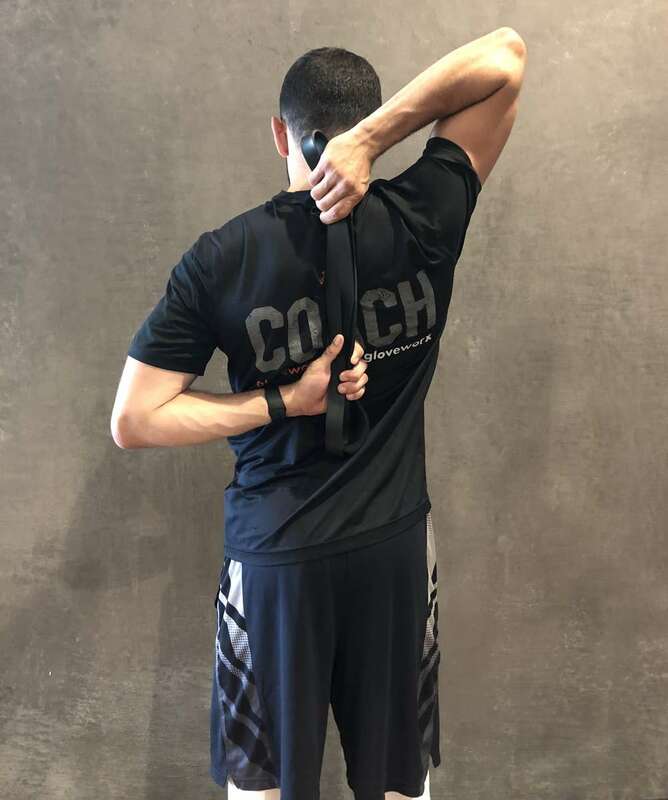 Ideally, you should be able to bring your shoulder joint to 180 degrees of shoulder flexion to safely press your arms straight against the wall or floor without arching your lower back. While in a standing position, you should be able to move your raised arms back enough for a person standing at your side to see your eyes and ears. If you have limited mobility in your shoulder or experience any shoulder pain as you try these exercises, consult with a physical therapist right away. Proper form is essential while performing any type of exercise. To increase your shoulder range of motion, move your body parts as far the joints comfortably allow. For example, when throwing a punch, keep your elbows tucked close to your body. This will help you use the rotation and weight of your body to power your punch, rather than putting the pressure on your shoulder joint. Constantly putting added pressure on your shoulder limits your range of motion. Not only does this risk injury, it also minimizes the benefits of the exercise as you are not able to flex to your maximum range of motion. 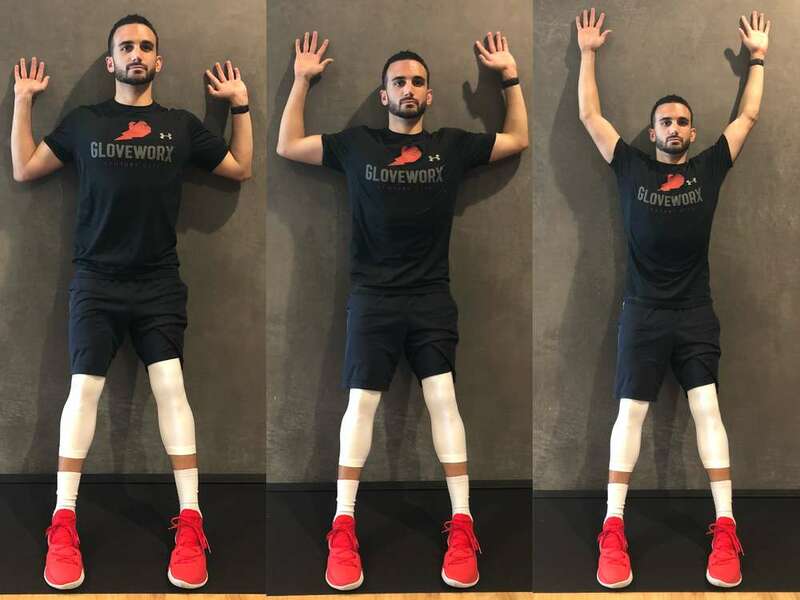 Working with a Gloveworx coach can help you ensure proper exercise form. Flexibility is a crucial element of joint stability. Irrespective of whether you’re currently experiencing shoulder problems or not, you should do the following exercises to strengthen your shoulders and to improve their range of motion. These exercises not only improve your shoulder impairment symptoms, they also help prevent future injury. Before starting on these flexibility exercises, do a ten-minute warm-up session with light cardio. You should never stretch a cold muscle. You can also do these stretching exercises after your strength training sessions. 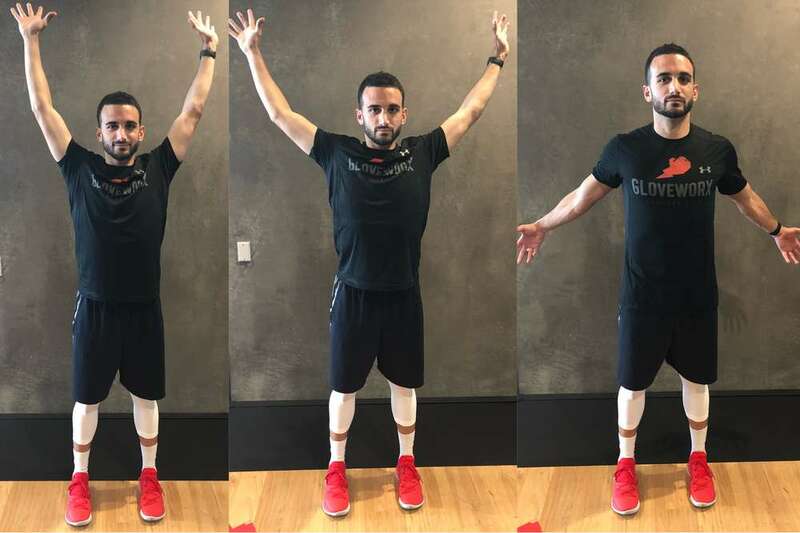 Below, Coach Carlos demonstrates some helpful exercises you can do to improve your ROM. This is a mild, but effective stretching exercise that improves shoulder range of motion. Stand straight with your back to a wall. Lean backwards until your entire back is pressed against the wall. Raise your hands straight above your head; your hands should be touching the wall. Now slide down the hands slowly till your arms are bent at a 90-degree angle. Continue to slide them down the wall until the top of your fingertips are at eye level. Now raise the hands back up again until straight. Do 3 sets of 10 reps of this movement. Hold your arms straight out from your sides and make circles with them. Rotate forward 10 times and then reverse the direction to rotate them backwards. Start with small circles and gradually work towards enlarging the circle until you are able to do windmill arm circles. 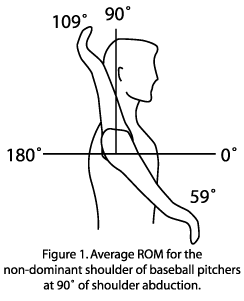 You can increase the size of the circles and your speed of rotation as your shoulder range of motion improves. Stand upright and cross the right arm across your body. Hold your right elbow with your left hand and slowly press it towards your left shoulder until you feel a gentle stretch. Hold for 10 seconds. Now repeat with the left arm across the body. You can do this shoulder exercise in the the classic Cow-Face pose leg position or simply standing up. This slight modification of the classic yoga pose releases muscular tension from your shoulders, neck, and back. Hold a towel in your right hand and bring your right arm into position by holding it back behind your back over your shoulders. Now place your left arm behind the back and bend the arm upwards with the palms facing outwards. Grab the towel hanging from the right hand, using your left hand. As your range of motion improves, you can eliminate the towel and try to clasp the fingers of both hands behind your back. Now repeat the same motions with the left arm over the shoulder and clasping from below using the right hand. Hold each stretch for 5-10 seconds. This is an extremely simple, yet effective exercise for your shoulders. Sit or stand erect. Do not hunch forward. Roll your shoulders up towards your ears and then back down in a smooth forward circular motion. Repeat this movement 10 times and then reverse the direction to roll your shoulders in a backward circular motion. Do this movement also 10 times. To strengthen your shoulders and upper back, you can do this exercise holding dumbbells in both hands. Keep your elbows slightly bent and relaxed. Roll the shoulders 10 times in each direction and then rest for 30 seconds. Do a minimum of three sets. You can increase the weight as your shoulders grow stronger. 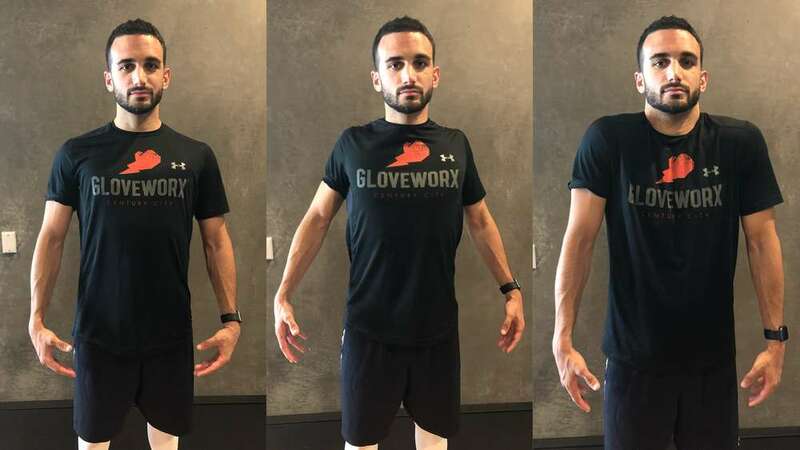 Remember to do these stretching exercises after your Gloveworx boxing sessions. Shoulder injuries and pain are prevalent among boxers and weightlifters. When you do exercises such as pull ups and barbell squats without first strengthening your shoulder and improving your shoulder range of motion, you risk injuring your shoulder muscles. To perform these exercises safely and effectively, the glenohumeral joints of the shoulders should be able to move easily through their entire intended range of motion. Boxing or weight training may look easy, but for best results, proper technique is essential. Schedule a session at Gloveworx. In a focused and vigorous session, you and a coach of your choosing can create a personalized program to help you build strength, speed, power and agility. Your coach will guide you through a wide range of targeted regimens, keeping you focused and motivated in attaining your fitness goals so you can Become Unstoppable.